Mike Moustakas in the dugout. Photo by me/ August 26, 2010. 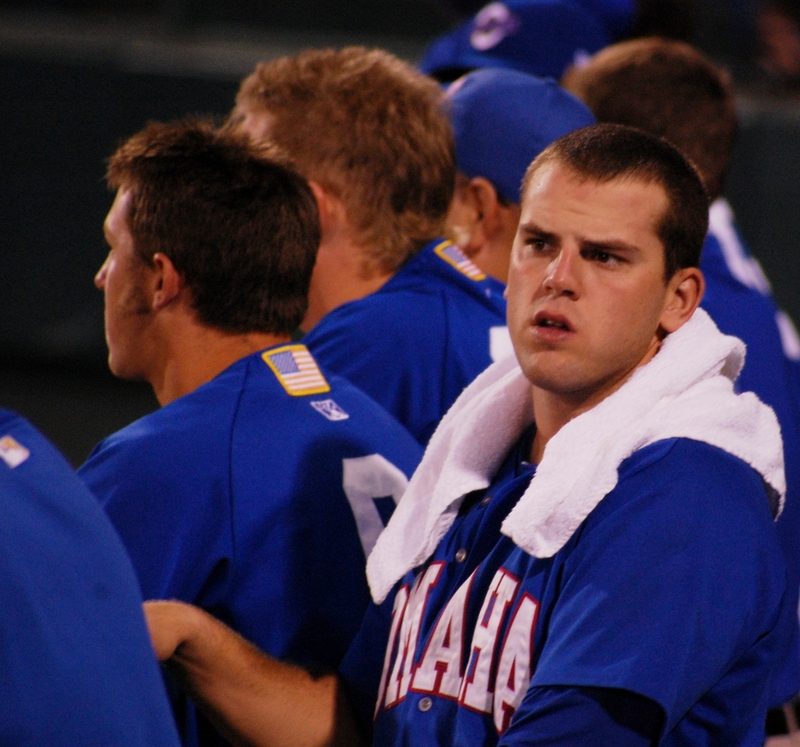 Mike Moustakas arrived in Omaha just in time for a team-wide swoon. The ORoyals were doing fine until the All-Star Break, then skidded for the second half of the month, going just 8-11 and falling down a bit in the standings. Moustakas himself didn’t adjust to Triple-A pitching right away, putting up a line of .247/.253/.468 in July. As July ended, the Omaha roster started emptying out into the Majors. Alex Gordon played his last game with Omaha on July 20, and the other best hitter in the entire league, Kila Ka’aihue, went up to the Majors on August 1. Two starting pitchers, Phil Humber and Bryan Bullington, made the trip down I-29 at about that time too. Oh, and Greg Holland, who had been lights-out for Omaha, also went to KC at July’s end. That would have been a good time to dismiss the ORoyals. What kind of team could lose the two best hitters in the league, two-fifths of its starting rotation AND part of its bullpen…and get better? But sure enough, Omaha is 18-9 in August and still in the mix for a playoff spot. But shoot. Everything I thought I knew might be wrong. Sure, Moose’s contributions to the team can be measured in stats, but he’s also somewhat of a leader. (Stop rolling your eyes, guys! I know!) It’s hard to look around at the team, with many guys playing way above their talent levels this month, and NOT think Moose has something to do with it. Everyone’s playing loose, and dare I say it – just having fun out there. Bench players have been way more into games this month; they all appear to be more genuinely excited for their teammates than I’ve ever noticed. And as cheesy as it all probably sounds to the seamheads out there, it seems to be working, so I’ll take it. David Lough has taken a deathgrip on a spot in the everyday lineup with this August line: .380/.453/.522 with 5 doubles, 4 triples, 4 steals and his usual gorgeous defense. He’s striking out a bit more than usual, and walking a bit less, but making up for both of those with his hitting. Lucas May has been a very nice addition at catcher, putting up .275/.359/.475 in August. (He also played one game for the ORoyals in July, in which he went 1-4.) Consider that he basically replaced Edwin Bellorin, who…well, he could not hit. There’s no nice way to describe that. Upgrade! Scott Thorman has been white-hot in much of this month, and if I believed in “clutch hitters” I’d say he has been one. Ed Lucas is slipping a bit this month, but his August line is still .257/.381/.438. The entire bullpen: The bullpen has given up 39 runs this month, and with one exception, the pen’s worst days were games when the team was already behind. When they’ve needed to, Omaha’s relievers have been able to hold leads, or at the very least keep games close. – There are only 4 games left at Rosenblatt, so get out to the park this week! Hurry! – And as you leave the park, pick up a pocket schedule for next year. The ORoyals will play at home on my birthday again, which is always fun. The first home game at the new park will be April 15, so mark your calendars. – Have you voted yet for the new team name? I’m still not sure if I’m officially allowed to have an opinion on this but, ummm…vote Royals. What name could possibly be better? -Lastly, please go treat your eyeballs to my photos from Thursday’s game. It was a heartbreaking loss, sure, but I got some awesome photos out of it (including the one at the top of this post. And one of Anthony Lerew with a Thunderstick noisemaker in his pants. Baseball! ).